Are Omikron CallHelp 400 Paging Systems license free? 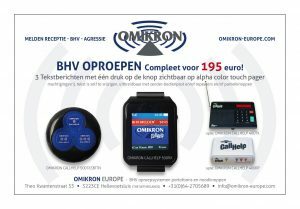 The Omikron CallHelp 400 series are license free for use in the EU. The paging systems from the 400 series can be used without a license. It saves cost for requiring and maintaining a license for each and every year of use. Also every page or call is free of charge. How to solve receive problems if the range is too short. If necessary one or more repeaters can be placed to solve the range problems. Why does the pager give a “beep” every other minute? The receiver Omikron CallHelp 400RX beeps every minute 2 x. The display shows “b”. This means empty batteries. Put the pager in the charging unit. The transmitter display Omikron CallHelp 400TX shows for example L03? This means the last working repeater NO 3 is found. The number in the display should show always the number of the last repeater( example L28 or L06 ). The repeater Omikron CallHelp 400RP “Status en Learn” led is on. This is correct. The “power” led will only flash if no power is available. When should the emergency back-up battery from the Omikron CallHelp 400TX and Omikron CallHelp 400RP be replaced? We advise to replace every year the emergency back-up batteries tob e sure that in case of an emergency the batteries are 100% loaded and functioning. The display from transmitter Omikron CallHelp 4000TX shows a “green” LED turned on. This means the unit is working on it’s emergency back-up battery. You need to check the external power supply asap. Is your question not mentioned? Please contact us. You can contact us here.